Ancient Empires Lux is a computer strategy game that lets you play as all the great ancient civilizations – Ancient Sumeria, Egypt, India, Greece, China, Rome and more. 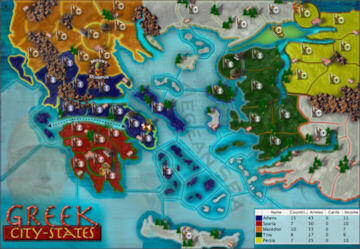 Players take control of the greatest early civilizations of mankind, and the game features maps, statistics, and the ability to play as any of the nations vying for control of each empire. You can play as just the strongest, or work cleverly to achieve victory from the humblest of beginnings. You can play as 58 different nations overall on this comprehensive trip through early history. Each empire comes as a map containing the real geographic layout marking the important cities and regions of the time. Four varying levels of difficulty provide a good challenge for newcomers and experienced Luxers alike. Beat the game on Emperor level and a special super-hard difficulty will unlock itself. Background information on each empire is included, along with links to full histories.